BRIDGETOWN, Barbados, Dec 28, CMC – In 2017, the Caribbean felt the full brunt of climate change with a warning that current trends indicate that there will be no respite. Within a two-week period, Hurricanes Irma and Maria brought home the reality of the impact of climate change as they churned their way across the Lesser Antilles destroying everything in their paths. Hurricane Harvey had in August set the stage for what was to come; with devastation in Houston, Texas, amounting to nearly US$200billion. 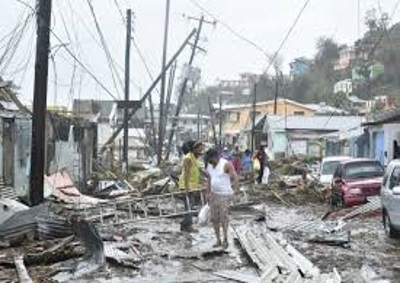 “The unprecedented nature of this climatic event highlights the unusual nature of weather patterns that continue to affect nations across the globe,” the Caribbean Community (CARICOM) Secretary General Irwin LaRocque said in a message to United States President Donald Trump, as Harvey made landfall in the United States after whipping up strong winds and heavy rains in the Caribbean. It took less than a month for his statement to bear fruit. 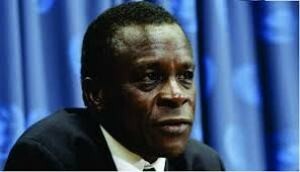 Hurricanes Irma and Maria, two Category 5 storms left so many Caribbean islands devastated in September that the CARICOM Chairman and Grenada’s Prime Minister Dr. Keith Mitchell said “there can be no question that for us in the Caribbean, climate change is an existential threat”. 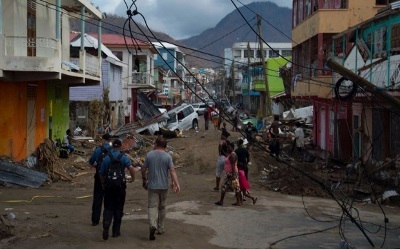 The islands dealt the hardest blow were Barbuda where the entire population had to be evacuated to the larger island of Antigua, Dominica where at least 30 people were killed, Anguilla, The Bahamas, the Turks and Caicos Islands, The British Virgin Islands and St. Kitts-Nevis. “Our hospital is without power, and schools have disappeared beneath the rubble. Our crops are uprooted. Where there was green, there is now only dust and dirt. The desolation is beyond imagination,” an emotional Skerrit said, noting that Caribbean countries do not produce greenhouse gases or sulphate aerosols, nor do they pollute or overfish the oceans. “We have made no contribution to global warming that can move the needle. But yet, we are among the main victims – on the frontline,” he added. But even as the international community pledged more than two billions US dollars in aid, loans and debt relief, for regional countries there’s a great deal more to be done. For years, Caribbean countries have complained about the conditions for accessing concessionary loans on the international market and United Nations Secretary General António Guterres urged the international community to re-think the policy. Guterras, who paid a visit to hurricane battered Caribbean countries, said most of the islands impacted by the storms were middle-income countries and because of that, they are deprived of the form of assistance or concessional loans that low-income countries can have access to. 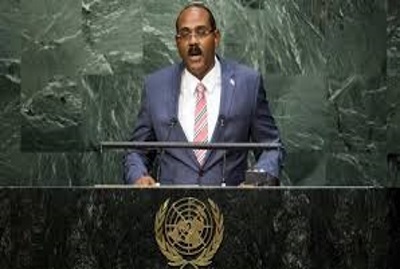 Antigua and Barbuda Prime Minister Gaston Browne argued that it was unfair for small, vulnerable states to be denied access to concessionary rates because of their per capita income. He told the UNGA there was no justice in large, wealthy countries borrowing at a favourable three per cent per annum while “so called ‘high income’ small island states are forced to borrow commercially at 12 per cent per annum, to repeatedly rebuild. “The Caribbean is in the ‘eye of the storm’ and we need coordinated international support to rebuild and better plan for the future. At the World Bank Group, we welcome the Caribbean Climate-Smart Coalition and plan to support it so countries get back on their feet and are better able to deal with the growing frequency and intensity of storms and hurricane,” said Jim Yong Kim, World Bank Group president. “This is a great first step. Now, we need to turn this possibility into a set of realities that benefit all our people. We all need to work together to change the rules of the game to accelerate climate-smart financial flows for the Caribbean,” said Mitchell. The managing director of the International Monetary Fund (IMF), Christine Lagarde, said the Washington-based financial institution is prepared to support the Caribbean with recovery funding and is cognizant of the impact of natural disasters on economic development and stability in the Caribbean. Addressing the sixth IMF High level Caribbean forum in Jamaica in November, she said that the IMF is ready to provide leadership with sourcing special funding and expertise to assist the region in developing mitigation and resilience strategies over the short and long term. Lagarde said the hurricanes “have again highlighted the special vulnerabilities of the Caribbean, and the need to strengthen its resilience. Barbados and Trinidad and Tobago during the year reiterated their positions of not going to the IMF for assistance to reverse their ailing economies, while Belize said it had rejected an offer from the Washington-based financial institution. “Barbados cannot turn its back on having its debt restructured under a Fund programme. It cannot run its back on having many of these other things…done under a Fund programme,” warned former Barbados Prime Minister Owen Arthur, an economist. “In this period of significant decline in foreign exchange inflows, it will be unreasonable and dangerous to use up our foreign exchange as we were accustomed to,” Prime Minister Dr. Keith Rowley has said, noting, “this would be paving our way into the arms of the IMF, and that is something that Government is not prepared to do”. He said there had been a 90 per cent decline in revenue between 2014 and 2017 from the energy sector. Belize Prime Minister Dean Barrow, who has already signalled his intention to quit active politics, during the year implemented a number of belt tightening measures and froze expenditure on non-essential goods and services. He said that his administration, had prior to the presentation of the national budget, held discussions with the IMF whose recipe was to increase taxation, eliminate those items “mostly basic food and medical supplies, that are zero rated, cancel exemptions for the productive sector and raise the tax take from the personal and business income. Guyana has said it will be working with the US based oil giant, ExxonMobil, to develop a long-term relationship founded on transparency, accountability, openness and aligned interests for the good of the country following its newfound wealth. “We are at the start of an oil and gas industry….we take decisions at the Cabinet level and then those decisions are taken to the National Assembly and we do not see that process changing. All Guyanese must feel involved in the process,” Granger said. However, by yearend there was controversy over the payment of an estimated US$18 million signing bonus. “Let me say that signing bonuses are customary and normal in many petroleum agreements, not all, but in many around the world as part of the total financial agreement”, said ExxonMobil country manager, Rod Henson, as the opposition People’s Progressive Party (PPP) pressed the government to come clean on the issue. The CDB is predicting that economic recovery in the Caribbean will be at 1.7 per cent this year based on a return to positive growth in Trinidad and Tobago. “Notwithstanding, the risks to the outlook are tilted on the downside. Domestic headwinds to growth reside with the legacy effects of the (mosquito borne) Zika virus although no longer an international epidemic in redirecting tourist arrivals away from the region; and the loss of CBRs, (correspondent banking relationships) which could affect financial stability,” it added. The St. Kitts-Based Eastern Caribbean Central Bank (ECCB) unveiled a five-year strategic plan which it said focuses on the goals that are needed to improve the financial institution’s relevance and address more strategically, the expectations of stakeholders in relation to socio-economic transformation. 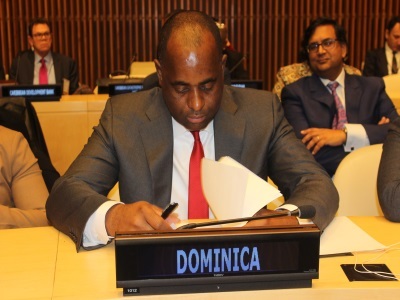 “At this point in the region’s history when it is facing unprecedented challenges related to high unemployment and devastating natural disasters, the plan takes cognizance of these and other challenges and is aptly themed: ‘Transforming the Eastern Caribbean Currency Union Together,’ said the ECCB, which acts as a central bank for Antigua and Barbuda, Dominica, Grenada, St. Lucia, St. Vincent and the Grenadines, Montserrat, St. Kitts-Nevis, Anguilla and the British Virgin Islands. But even as the Caribbean was putting its economic house in order, it has yet again been stung by policies in Europe likely to affect economic growth. The European Union named several regional countries as tax havens with Prime Minister Skerrit jokingly advocating for CARICOM countries to reciprocate. But it was no laughing matter for the 15-member grouping that strongly objected to the listing. LaRocque said the decision by Europe had been based on new and unilaterally-determined criteria that go beyond the generally accepted international tax transparency and accountability standards. The University of the West Indies (UWI) also chimed in on the issue with the Vice-Chancellor, Sir Hilary Beckles, noting the unilateral EU blacklisting “undermine the entire process of accountability and fairness in financial matters carefully constructed by the world community. New governments came to office in 2017 even as there was widespread speculation that voters in several other Caribbean countries would be going to the polls in snap elections. In the Bahamas, medical practitioner, Dr. Hubert Minnis led his Free National Movement (FNM) to a convincing victory in the May 10 general election almost wiping out the then ruling Progressive Liberal Party (PLP) that won four of the 39 seats at stake. Among the causalities was Prime Minister Perry Christie, who subsequently resigned as party leader with immediate effect. In an unprecedented move, long-time political rivals Alden McLaughlin, the incumbent premier and leader of the Peoples Progressive Movement (PPM) and McKeeva Bush who heads the opposition Cayman Democratic Party (CDP), signed an agreement to form a coalition government in the Cayman Islands after the general election provided a mixed bag for the major political parties as the independent candidates claimed victory in most of the seats in what was described as a “historic poll”. In another British Overseas Territory, David Burt, 38, emerged as the youngest ever head of government in Bermuda after he led his Progressive Labour Party (PLP) to a 24-12 victory in reversing the defeat the party had suffered at the hands of the One Bermuda Alliance in 2012. In the Dutch island of Curacao, the Partido Alternativa Real (PAR) led by its new political leader, Eugene Rhuggenaath won six of the 21 seats in Parliament with the PARTIDO (MAN) party and the MFK, the former coalition partner in the last government, winning five seats each,. The Korsou di Nos Tur (KdNT) won two seats, and the PIN, PS and Movementu Progresivo (MP) winning one seat each. Prime Minister Browne removed his tourism and investment minister, Asot Michael, from the cabinet following his detention at the Gatwick Airport by British law enforcement authorities. “…prior to his arrest (I) knew there was an issue in which there was an investigation involving him and by the way what I was told it involves him soliciting contracts for a UK national,” Browne would later inform the nation, while Michael in a statement said that he was “sorry” that the prime minister had not contacted him prior to making public his removal from the cabinet. Montserrat Premier Donaldson Romeo fired his agriculture and environment minister, Claude Hogan, with immediate effect less than 48 hours after Hogan took to the airwaves saying there was need for a new paradigm in dealing with the socio-economic development of the volcano ravaged British Overseas Territory while downplaying persistent rumours of plans to oust Romeo as head of the government. St. Lucia’s agriculture minister Jimmy Henry resigned following reports that he was recently stopped and searched at the George Charles Airport. ” I have decided to tender my resignation with immediate effect from the senate and as a Minister. Due to these personal matters at this time, I am unable to give the attention necessary to my ministerial duties,” Henry said. Jamaica’s first woman Prime Minister Portia Simpson Miller as well as her ministerial colleague, Dr. Omar Davies, quit active politics in 2017 and the sudden death of Dr. Winston Green, resulted in three-by-elections. 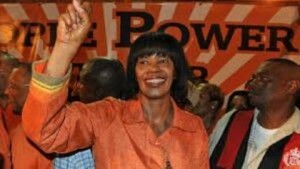 The main opposition People’s National Party (PNP) suffered a setback after it lost one of the three seats it previously held in the Parliament to the ruling Jamaica Labour Party (JLP). Sir Lester Bryant Bird, who served as the second Prime Minister of Antigua and Barbuda announced his retirement from active politics. Sir Lester, who was born on February 21, 1938 served as prime minister from 1994-2004, replacing his father, Sir Vere Bird. “I know that, in as much as my brain has much to contribute, age has taken its toll on my physical capacity. 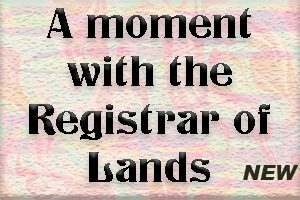 It would be unfair to impose upon the readiness of the people of Rural East to maintain me as their representative,” Sir Lester told the Parliament. Attorney Joshua Francis, the former deputy leader of the main opposition United Workers Party (UWP), announced his resignation from active politics in Dominca, describing his “political journey” as being “very turbulent”. In Grenada, where there has been much speculation that Prime Minister Mitchell will call an early poll, the deputy leader of the ruling New National Party (NNP) Elvin Nimrod, announced his resignation from politics. There had been widespread speculation also in Barbados of Prime Minister Freundel Stuart seeking a fresh mandate from the electorate with the main opposition Barbados Labour Party (BLP) urging him to do so accusing his administration of bringing the island into ruin. “I want to exhort members of the Democratic Labour Party not to grow wary … you have nothing to be ashamed of, don’t get distracted by a lot of the incoherent noises you hear from time to time. Those issues are going to be settled on a date that I will determine,” Prime Minister Stuart said, adding “we will rout our adversaries and put them to flight”. While there has been speculation about early polls in other Caribbean countries, the main opposition in St. Vincent and the Grenadines is continuing a legal challenge to the results of the 2015 general election that led to in the Unity Labour Party (ULP) of Prime Minister Dr. Ralph Gonsalves securing a fourth consecutive term in office. The main opposition New Democratic Party (NDP) says it has a duty and obligation to pursue to the end, the two election petitions that are still before the court and a High Court judge is expected to hand down a ruling early in 2018 on moves by the opposition involving the ballots used in the election. “Just remember how it was in December of 2015. After the election, the people felt that something was wrong. I was out on the streets of Kingstown and people were angry and we told them, yes, come out, express yourself, do it peacefully, because that is the way that we do things in St. Vincent and the Grenadines,” said NDP leader Dr. Godwin Friday. In Dominica, legal moves are underway to declare Opposition Leader Lennox Linton, bankrupt, which could result in his removal from the Dominica parliament. Chartered accountant, Kieron Pinard-Byrne, said he has instructed his lawyers to proceed with the move after Linton failed to pay a significant sum of money awarded to the accountant by the London-based Privy Council, which at the time served as Dominica’s final and highest court. According to the bankruptcy petition filed in the High Court here on December 6, Pinard-Byrne said that on September 15, this year, Linton paid £1,200.00 towards the judgment debt and £24,792.12 with five per cent interest per annum remains unpaid. Dominica also grabbed the regional headlines in 2017 when police used teargas to o disperse supporters of the UWP after they set fires across the capital and looted several business places. The protestors had earlier marched to the Financial Center, where the office of the Prime Minister Skerrit is located, demanding his resignation as well as his entire Cabinet. Government would later view the unrest as an attempt to seize power by force. In Haiti, the Provisional Electoral Council (CEP) is yet to decide on the political future of former rebel leader turned politician, Guy Philippe, who pleaded guilty earlier this year to a drug money-laundering charge in the United States. The deal between US law enforcement authorities and Philippe resulted in the former police officer avoiding a potential sentence of life in prison for cocaine trafficking. More than 100 members of the United Nations backed a non-binding resolution that called on President Trump to reverse his decision to recognize Jerusalem even as Washington threatened it would not forget countries that support the resolution that read in part “any decisions and actions which purport to have altered, the character, status or demographic composition of the Holy City of Jerusalem have no legal effect, are null and void and must be rescinded in compliance with relevant resolutions of the [UN] Security Council”. No CARICOM was in support of the US move with Washington. However, Antigua and Barbuda, Bahamas, Jamaica and Trinidad and Tobago were among the 35 countries that abstained during the vote. Among the CARICOM states that voted with the 128 countries in favour of the resolution were Barbados, Belize, Dominica, Grenada, Guyana, St. Vincent and the Grenadines and Suriname. St. Lucia was among the 21 countries that stayed away from the UN General Assembly on the day of the vote and the island’s Foreign Affairs Minister Sarah Flood-Beaubrun would later say that St. Lucia was of the opinion that the matter of the location of a foreign mission is solely a decision for a sovereign country to make. Gun related murders were becoming a daily occurrence in countries like Jamaica, Trinidad and Tobago, Bahamas and Belize during 2017. The death toll in Jamaica had increased by 21 per cent over the 2016 figure with the authorities reporting 1,581 murders, one week before the end of 2017. The authorities said 53 children were among those killed. 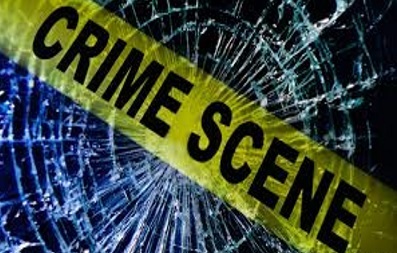 Trinidad and Tobago was nearing the 500 mark by yearend as compared to 463 the previous year, while in Belize, the police blamed gang rivalry for contributing to the 138 murders, two weeks before the end of the year. Sadly, the region bade farewell to several people, including the region’s second Nobel Laureate, Sir Derek Walcott of St. Lucia, the St. Vincent and the Grenadines social and political activist, Oscar Allen, whom Prime Minister Gonsalves described as “one of our outstanding sons” and the Jamaican football administrator , Horace Burrell. The Bahamas gave an official funeral to former National Security Minister, Dr. Bernard J. Nottage, who died in a United States hospital. Haiti also gave a state funeral to former President Rene Preval. Several members of the media fraternity also passed, including Jamaicans Lester Spaulding and Ian Boyne, Grenadians Trevor Thwaites, Wayne Modeste and Rollin Williams, St. Lucian Lawrence James, while Trinidad and Tobago said farewell to Devon Mathew, a radio announcer and soca star as well as Deborah John, the daughter of the late journalist George John.